Thank you to Culinate.com for featuring us in your Blog Feed section! For those of you who don't know, Culinate.com is a fantastic new food site based in Portland, Oregon that "features articles and essays that address the multitude of intersections between food and the rest of our lives." They have lots of great content, and you should definitely check out the whole site if you've never been. If winter is Gruyère season, and early summer is Camembert season, then this month is certainly award-show season. Every year it seems March is burdened with yet another Sunday night extravaganza. But beyond all the glitz and glamour, we all still have to eat. 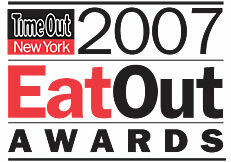 So, following in the footsteps of the SAG awards, and the NAACP Image Awards, oh and of course that other famous awards show, Time Out New York has opened up voting for the 2007 Eat Out Awards, celebrating the food & beverage scene in this great city. So why am I writing about this on a cheese blog? Because there's a category for Best Cheese Shop, of course! 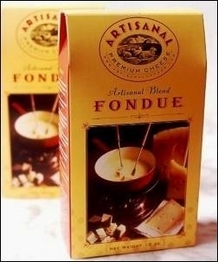 Fondue is great--it is one of my favorite ways to consume melted cheese (next to pizza maybe). It's also one of those things that's fairly easy to reproduce at home, even though the equipment required is bulky and inflexible. When my wife and I got married, we of course received the obligatory fondue set as a present (thank goodness we only were given one set). And when she asked what the %*$# we should do with it, I answered, "Use it!" Sprout Creek Farm, a a small non-profit farmstead creamery in Poughkeepsie, NY, recently posted a short promotional video on their site. Since they are a non-profit they are always looking for donations to help keep the farm's educational programming afloat, and hopefully this video will help get the word out about the wonderful work they're doing, as well as the fantastic cheeses they're making! I'd like to believe that this strange set of television ads for Parmigiano-Reggiano is something only native Italians can understand, but I also suspect that there are far weirder things appearing on American television every minute of every day. In any case, this video should make for a couple of minutes of bewildering fun. Best Egg and Cheese Sandwich Ever? Head over to Saxelby Cheese this week for the "best egg and cheese ever." I've been contemplating publishing a recipe for the best egg and cheese sandwich, but I've always struggled with picking the perfect cheese to use. The most common permutation you can find uses Kraft American Singles, my feelings for which have been made amply clear on this blog. In fact I've spoken to some people who cite egg and cheese sandwiches as the perfect vehicle for processed cheese. I beg to differ, and I've always believed a better cheese makes for a better egg and cheese sandwich. Proving my theory that cheese is great any time of day, this weekend we did a breakfast cheese plate for some family who were in for a visit. I went with cheeses that were on the lighter side of things, and I also chose with my guests' tastes in mind. I did my shopping at a store I really trust (Stinky Bklyn), and they also helped me pick these out by making some really great suggestions. If you're like me, you grew up learning that the tongue has taste buds for each of the four basic tastes: sweet, salty, sour, and bitter. Moreover you learned that each of these taste bud groups are localized on the tongue, with sweet being on the tip, salty on the sides, sour on the sides as well but farther back, and bitter at the back of the tongue. It turns out that not only do these locales not exist, but also that there is at least one additional basic taste and probably several more. 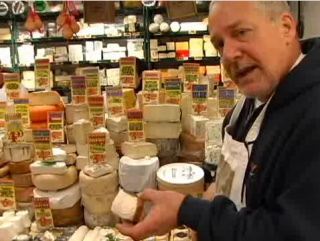 From Serious Eats, a great new website for "serious eaters," here's a nice little video about how to choose cheeses, featuring Fairway's legendary cheesemonger Steven Jenkins. Click on the image above or the link here to view the video.